Hawaiian’s Cable Beach Club Resort & Spa has been recognised at the Australian Hotels Association WA (AHA) - Accommodation Awards for Excellence, taking out two awards. The awards for best Resort Style Accommodation and Marketed Accommodation Hotel Award were announced last night in front of around 500 guests attending the gala dinner. It has been an award winning couple of weeks for Cable Beach Club Resort & Spa, also receiving international recognition at the prestigious World Luxury Spa Awards. The resort’s Chahoya Spa by L’Occitane received the award for the Best Luxury Day Spa in regional Australia. It’s the second time that the day spa has been recognised by the prestigious World Luxury Spa Awards. Last year, Chahoya Spa by L’Occitane took out the Best Luxury Day Spa Australia award. It was also a good night at the AHA's for one of Hawaiian’s key partners the Parmelia Hilton Perth, winning two awards – Engineering and Maintenance Manager of the Year and Sales and Marketing Manager of the Year. 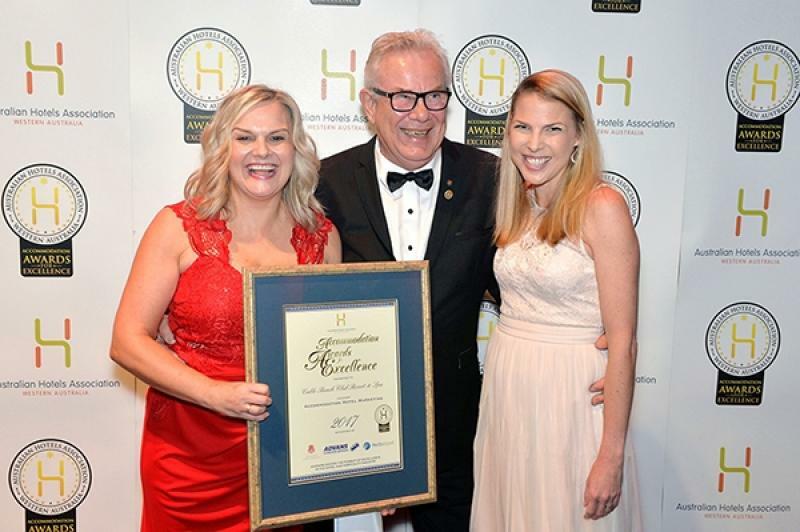 Parmelia Hilton Perth General Manager David Constantine was recognised for his outstanding contribution to the hospitality industry in WA by being inducted into the AHA Hall of Fame. The AHA Accommodation Awards for Excellence highlight WA’s leading hotel venues, their staff, and their commitment to building the State’s reputation as a tourism destination. For more information on all winners from the night click here.